ELECTRONIC gadgets can be the bane of every parent’s life. I’ve lost count of the times I’ve asked my son to take a break from his Xbox only to be greeted by a grunt and a surly ‘in a minute’. Imagine then, a world where your child is free to roam woods, jump streams, climb trees, sit around a camp fire and roll around in mud. Sounds like a different era? 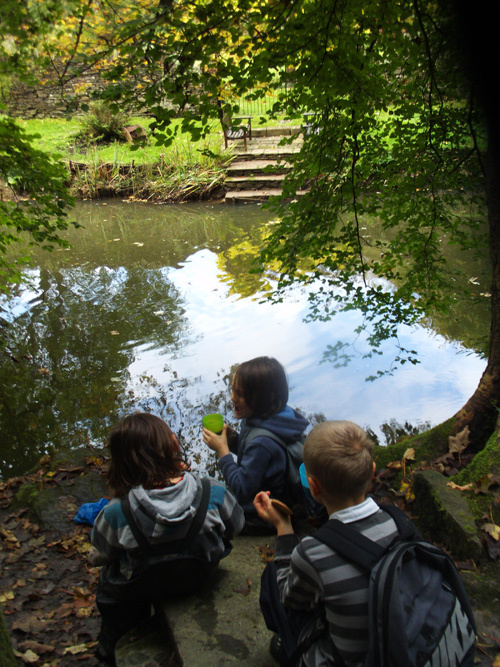 Then think again because thanks to one Mangotsfield mum, children are being given the opportunity to do just that. And they’re having the time of their lives. Nickie Corr is the woman responsible for setting up Mud Pie Explorers, offering child-led outdoor play in green spaces – whatever the weather. A favourite haunt is the woods behind Lincombe Barn in Downend, an Aladdin’s cave of fantasy adventure where a fallen branch may just be a bridge to escape from swashbuckling pirates and a large rock, a hiding place from crocodiles and lions. Nickie, 37, leads various groups for children up to around 11 years of age including pre-school groups where parents can join their children. Most of her sessions are part of the national Forest School initiative which encourages learning through a woodland environment. 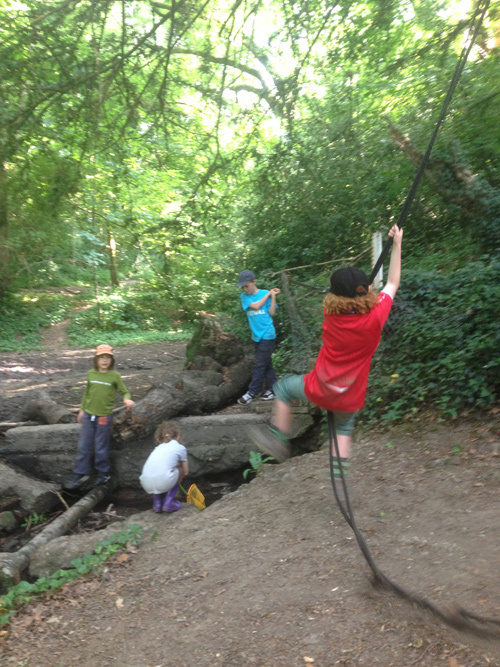 The sessions, which also take place in the woods at Leap Valley, are tailored to the needs of the various groups, for instance older children may want to swing across streams on ropes or sit around a camp fire while tots may prefer story-telling and painting with mud. Today, Nickie leads a two-hour pre-school group accompanied by her large bag of tricks. Inside lurks a map, books, first-aid kit, brushes for mud painting, string and scissors (“If you’ve got string and scissors handy there’s an infinite amount of things you can do,” Nickie tells me confidently), cardboard tubes to roar down to make animal noises, and, for this particular occasion, lots of teddy bears. She starts off by reading a story to the children, this time it’s the well-loved We’re Going On a Bear Hunt. Now this may all sound very tame so far but the next thing the children know, they’re travelling through the woods re-enacting the book. This involves crossing ‘long, wavy’ grass, negotiating ‘thick, oozy’ mud and passing through a ‘deep, cold’ river and a ‘big, dark’ forest. The children, enthralled by the story, follow Nickie’s lead, repeating lines from the book and keeping their eyes peeled for a bear. Finally, after climbing a steep bank they discover a ‘scary, dark’ cave, carefully planted by Nickie and harbouring the bear they’ve been busy hunting. 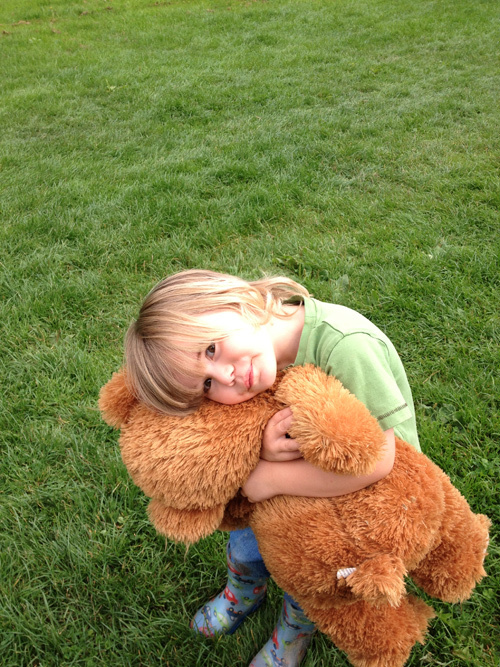 He doesn’t look harmful at all, in fact, he’s squishy and cute with an uncanny resemblance to a teddy. “It’s a travelling story,” explains Nickie. 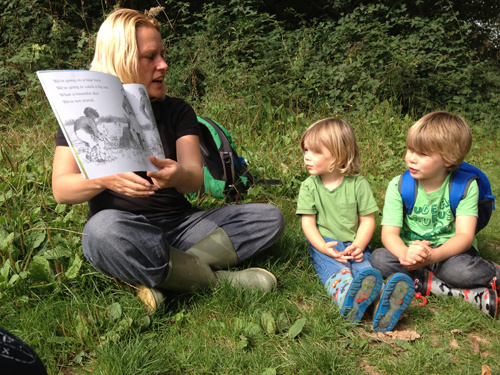 “You start off reading it to get the children familiar with it and then you read it again as you travel through the woods so it helps them to learn to sequence stories, which is an early literacy skill. “The main purpose is to have fun but there are so many benefits on lots of different levels. They’re getting physical exercise and they’re learning to share with other children. “There are lots of studies which show how nature reduces cortisol levels, a stress hormone in the body. 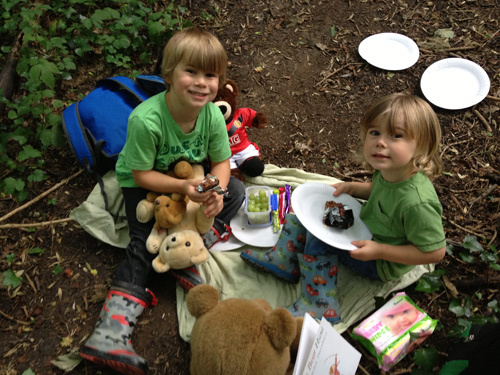 Anyone who spends time in the woods comes out feeling better and more chilled so it’s particularly good for children with emotional issues or special needs.” The group then settles down to enjoy a teddy bears’ picnic and munch on snacks to keep their energy levels up. “What did the banana say to the doctor,” he says. Alonzo’s response – “I’m not peeling very well” - is met with laughter from the group. 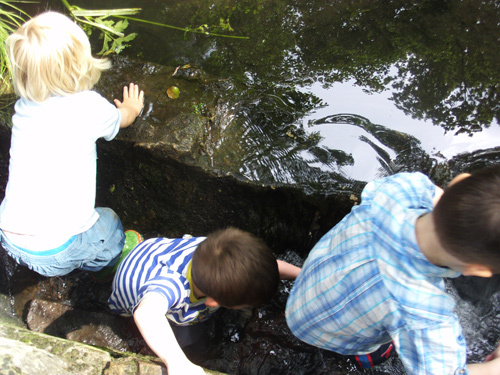 Next up is child-led play and the children find themselves in a clearing with everything they need to create a fantasy world – mud, water, trees, plants, a bridge, rocks and stones. They paint bear masks with mud and, protected by wellies, jump in the stream, their faces rapt with excitement. They merrily continue playing for a good hour before it’s time to head back to the car park. I’ve witnessed a session for pre-school children but how would Nickie run a group with older children? Alonzo’s mum Amy Millard, 32, started taking her son and his two-year-old brother Ambrose to pre-school sessions earlier this year. “They get to run around and get muddy without worrying,” Amy, who lives in Downend, said. “They love to be outside. The woods give them such a sense of freedom which helps them to think independently. “It’s also given them confidence knowing they are safe with Nickie around and that they can jump in the water and mud and stay safe. Nickie works at the woods with the permission of South Gloucestershire Council and the Friends of Lincombe Barn Park and Woods, a group Nickie is also a member of. The sessions last anything from two to four hours and include family groups as well as Nickie’s increasingly popular themed children’s Explorer parties which can include camp fires, pirates, dinosaurs and Harry Potter. Nickie, who has two sons, aged eight and 18, said future plans include running an evening session which would feature candles, lanterns and glo-sticks. “There aren’t many activities that children go to that allow this sort of freedom of experience and learning,” she said.